This not-too-sweet muffin is perfect with a cup of coffee or a glass of milk! You can use either fresh or frozen raspberries for these delicious muffins! These muffins are amazing! They have a rich cinnamon filling, crunchy streusel topping and a delicious glaze. Cindy also shows how you can make your own parchment liners… just like the upscale bakeries! These Apricot Muffins not only have amazing flavor, but Cindy makes it possible for you to bake them gluten free, if you'd like! Honey is a wonderful flavor in baked goods and these simple muffins showcase it beautifully! These mini muffins pack a big flavor! Lots of pumpkin, spices, cranberries and pecans....perfect for Autumn. When peaches are in season, keep a couple aside to get really ripe...then make a batch of these delicious muffins! A delicious and tender muffin filled with whole sweet cherries and topped with an amazing crumb topping. Perfect for breakfast! When strawberries are in season, these are a great muffin to make! These muffins are perfect for breakfast and a great way to use up any over-ripe bananas! Not too sweet, but loaded with walnuts and a few chocolate chips, these muffins are great for a late morning, afternoon, or bedtime snack. Truthfully, they're good anytime of day! Perfect for Easter morning, or any morning! A big blueberry muffin with the zest of fresh lemon....perfect for breakfast! Take all the best flavors of a Linzer Torte (raspberry, almond, lemon) and put them into a muffin that's perfect for breakfast....or tea....or a snack! Here's an old fashioned treat! 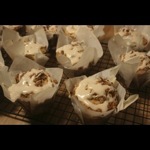 This coffeecake muffin has a bit of sweetness and a layer of chopped nuts and cinnamon in the center. You just may want to invite a neighbor over for coffee! A great muffin to make when you have a lot of lemons on your tree and it's perfect for either breakfast or tea! This muffin is easy to put together and the jam center makes it a hit at breakfast! These delicate and light muffins have lovely sugar & spice topping! Plump cranberries, walnuts and some orange zest make these muffins delicious for breakfast!